All Honor Our KIA Honorees from Spalding County now have a bronze plaque and a QR Code installed in their memory on a prominent building in downtown Griffin. Honorees are listed alphabetically without regard to the conflict during which they died. Beside each name is the street address of their individual plaque. 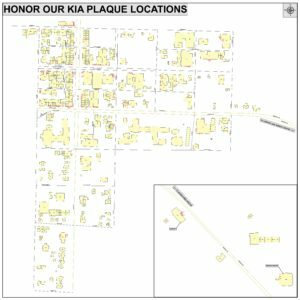 Also, beside each name is a number representing the location of that plaque on the accompanying orientation map of downtown Griffin. Keep in mind many buildings have more than one plaque installed there. Also, while the address faces one street if it’s a corner building plaques listed at that address may actually be located on the side street. 149 Conkle Seaman George Holman 800 Memorial Dr.
151 Ferguson Capt. Robert Langdon 800 Memorial Dr.
156 Larkin Lt Jasper Kennedy (Kay) 885 Memorial Dr.
154 Reynolds Pvt James 800 Memorial Dr.
153 Smith Lt Charles Davis “Snag” 800 Memorial Dr.
155 Smith Pvt Herman W 885 Memorial Dr.
150 Smith Staff Sgt Woodrow Wilson 800 Memorial Dr.
152 Wallace, III Tech 5 John Emmett 800 Memorial Dr.